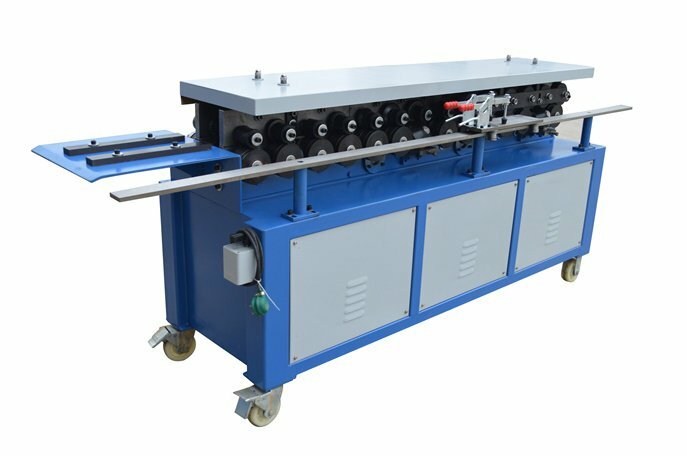 The TDF flange forming machine mainly used for manufacturing square and rectangular venting ducts and TDF self-made semi-finished flange, or producing finished duct combining with duct production line or shearing machine, reel machine, folding machine, locking the machine and corner code machine. 1. Our company offers two kinds of TDF flange forming machine: T12 and T15. Formed iron plate thickness from 0.5-1.5mm. 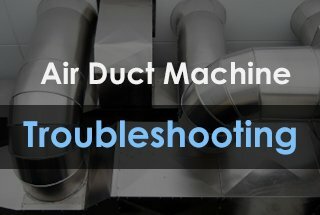 The machine is ideal equipment for site manufacturing ventilation exhaust duct in industrial & mining enterprises, hotel, shopping mall and construction industry due to its characteristics of small size, lightweight, easy to move, easy to adjust, easy to operate, reliable, stable. TDF flange forming machine components: rack, transmission part, flange forming part, hook forming part, power part (motor, reducer) etc. Applicable Material: Galvanized ordinary plate with Thickness of 0.6-1.2mm. 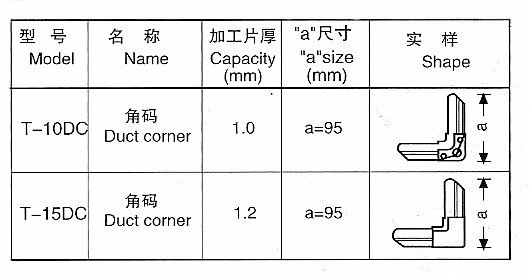 Product Accuracy: Size error does not exceed ±0.6mm; angle error ±2°. Hook code cutting size: width 60mm. 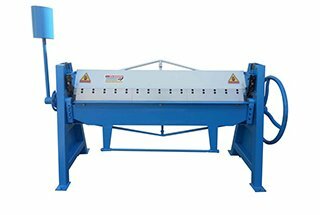 the thickness of 1.0mm lath, the machine is equipped with reel shearing machine, not need separate cutting. Power: Voltage shall be within 342-418V, Three-phase power unbalance voltage shall be control with range (both negative and zero sequences should not exceed 2% of the sequence). Frequency within 49.5~50.5. The rack is a welded shell, made of 8# national standard channel, solid and reliable, the entire transmission part, forming part and reducer all installed on the shell, the end of its side plate is fixed on the table panel with horizontal adjusting channel positioning plate on the panel. The entire transmission part is a turbine box driven through turbine reducer with a transmission ratio of 30:1( or other speed ratios), 3kw national standard motor, reducer drives two drive shafts through sprockets and chain, then the drive shaft gear drives the transit shaft, through multiple transit gear wheels drive the whole motion system. Both sides of the forming parts composed by fourteen rollers, one side for forming flange, the other side for forming hook, the forming rollers are made of GCr15 bearing steel through salt bath heat treatment and finishing, durable. All the shafts and gear are heat treated to ensure the use performance and life; Each tail has a shape-adjusting device to ensure the flange in line with the requirements. The side plate is made of forged steel and finished; TDF flange forming machine have fourteen group forming shafts, and each shaft is equipped with a drive gear and left and right rollers. 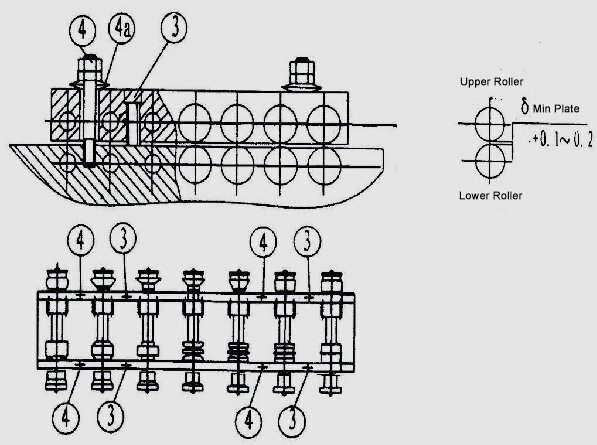 The left side is hook roller group; the right side is the flange roller group. In addition, the right side flange forming a part has a rubber material-holding wheel and a feeding car to ensure the whole forming course stable, and produce the qualified products. 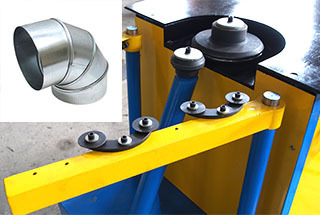 the gap between the upper roller and bottom roller can be adjusted automatically according to the rolling thickness. Such as T-12 machine, plate thickness between 0.6-1.2mm. 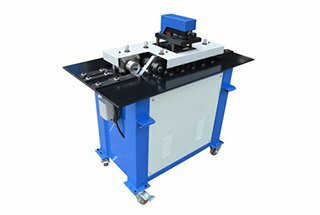 2) All new flange machine has been adjusted and qualified before ex-factory, if necessary, only need to adjust the feeding plate, four studs ③、④ do not easily adjust or move. 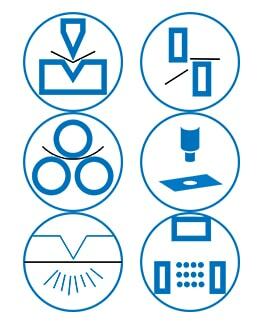 Ensure no component losing or omitting during transportation; Carefully check whether all relevant parts are complete and intact before installation. The lifting device shall be carefully checked and ensure it complies with requirements before lifting machine, at least two slings, and equal in length, during the lifting process, the lifting hook point shall be kept on the center position and keep a good center of gravity to avoid the machine lost the center of gravity and flip. When unloading, slowly put the machine on the flat ground, four-foot ground first, no one hanging in the air, put bearer if necessary, the machine can’t be tilted or side standing, otherwise, the machine will be deformed and affects the machine use function. The machine shall be installed on the level hardened ground. Assembling the suitable power( voltage, phase, frequency etc technical parameters) and earthling wire according to the requirement, the electric system according to the standard color line code to install. Thoroughly check each part, such as tensioning chain, drive belt tension condition, leakage protection, fastening bolt, ensure all parts in good condition. Check each fastener, if became loose, eliminate unsafe factors. 3. The use of auxiliary feeding trolley depends on the plate width and flange width. When the plate length less than 180mm, feeding trolley is necessary, put the plate on the trolley fastening with two clamps and put forward by workers during the rolling process. Is the plate length less than 180mm, the trolley can be dismantled from the sideways and put on an appropriate place. 4. The first time use, measure and check the results, if the bilateral sides are unequal, adjusting the stopping plate position and the parallelism between the material guide plate and feeding direction; If the large right-angle edge of the flange is larger than 90°, adjust the holding rubber wheel down and increase the holding force. If the flange curving upward/down, adjust the shape-adjusting wheel up/down. Gap variation caused by loosened bolt nut ③ and screw ④ or other reason need adjusting. First, loose all nuts④, put a plate with gap same thickness between the rollers and adjust the screw ③ until the gaps between four-side rollers almost same, then tighten the nut ④[δ=Min. plate thickness+0.1-0.2], if want the Min plate gap, leave a slight space will be OK. Loosen the screws on leading-in positioning plate and move the plate in the direction parallel to the slot to accommodate a sheet of different widths or different thickness, then tighten the guiding plate. In the production of the flange, if the sheets are thin, flange side hook size is not enough, slightly move the flange side feeding plate to the inside. 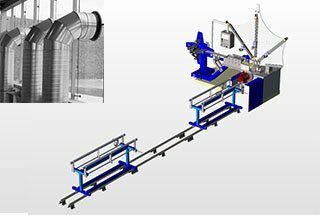 The TDF flange forming machine shall be operated by the professional operator, who should very familiar with the machine structure and performance and qualified after training, and in strict accordance with the< safety operation procedures>. If multi-user operation, a professional person responsible for command production is necessary. Regularly check the TDF flange forming machine condition, earthing resistance, leakage protection, ensure each circuit and electric component be in safe working condition. Maintenance or check the machine, you must first cut off power and remove and close the key before proceeding. Power voltage can’t exceed the rated voltage 10% to avoid electrical insulation aging. NO repair or adjusting is acceptable when the machine working. It is prohibited to touch the rotating roller, chain and gear with your hand. In case of any abnormal sound, odor occurred, immediately stop the machine for troubleshooting problems. The machine protective cover must be intact, incompletely- the assembled machine can’t be put into production. Maintenance personnel shall be familiar with the machine performance, specification, safety technical measures, mechanism position and its role, mechanical, electrical, transmission theory, the relationship between the order and action sequence and operating procedure before maintaining the machine. Filling lubricating grease/oil before each shift work according to the lubricating requirements. The machine prohibits forming sheet with welding scar or burr, or over-thick sheet. As for the motor, electric and control part, shock, moisture and anti-dust maintenance shall be taken into consideration. In the wet season, if long-time no use (more than one month), review and dehumidify the motor, electric insulation before putting into use again. Pay attention to that the exposed hose and wire must be intact. Keep the roller surface clean, timely remove the impurities and iron scrap in case of affecting the machine service life. Set up an equipment file, and formulate regular maintenance plan, make maintenance records and log. Clean up all scraps, remove the iron and dust and turn off the power and lock when each shift work is completed. The input voltage of the TDF flange forming machine is 380V, the input power socket must have a good grounding line to ensure safety. All share ball bearings on TDF flange forming machine have been fully filled lubricating grease, generally no need special care. The first time use, apply a little amount of oil on the inside of the side plate. It is necessary to take some measures to prevent iron scrap from falling into the bearing and affecting the bearing service life. The machine adopts open drive, regularly paints some lubricating grease on the gear tooth. Timely removes the iron scraps falling on the gear and rollers and paints some lubricating grease on the roller surface. 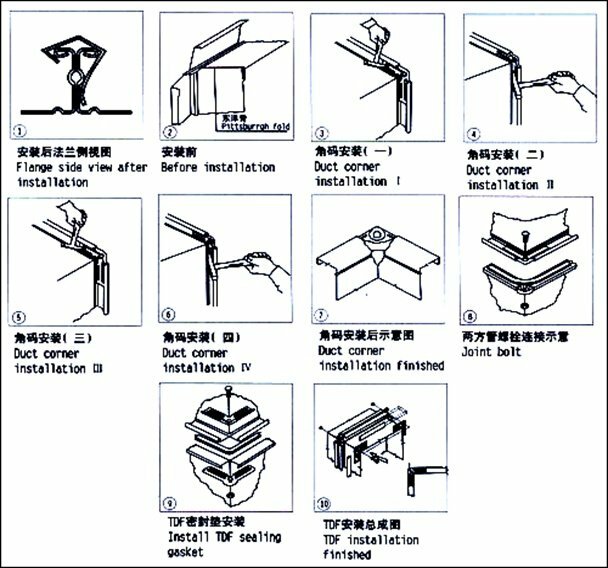 During the rolling process, the workpieces are gradually formed, if the plate has come to the fifth roller, it is prohibited to retract, if it is necessary to exit the material, loosen the nut ④ and lift⑥ beam, then retract the material, otherwise, it will damage the machine.